There was no indication that improvement is achievable, nor any understanding that the least efficient modes on 34th Street — private cars and taxis — slow down the far greater number of people who take the bus, and make the street more dangerous and unpleasant for the even greater number of people on foot. What the naysayers never seem to acknowledge is that 34th Street has changed and changed again over the course of New York City’s history. 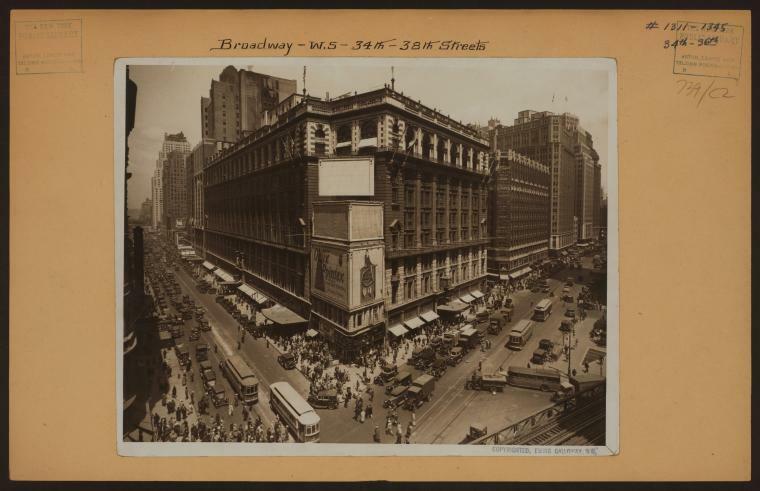 To argue that 34th Street should never change again is to argue that at some point in the mid-20th Century, the city’s planners hit on a solution that was perfect for all eternity. Since then we’ve learned a lot about how traffic works. We know that traffic volumes are not constant, and that when streets change, drivers adjust their decisions and their behavior. We know that on 34th Street and other major crosstown streets in Manhattan, traffic is strangling transit service, slowing buses to walking speeds. And we know that other cities have successfully created transit malls in their central shopping and business districts. 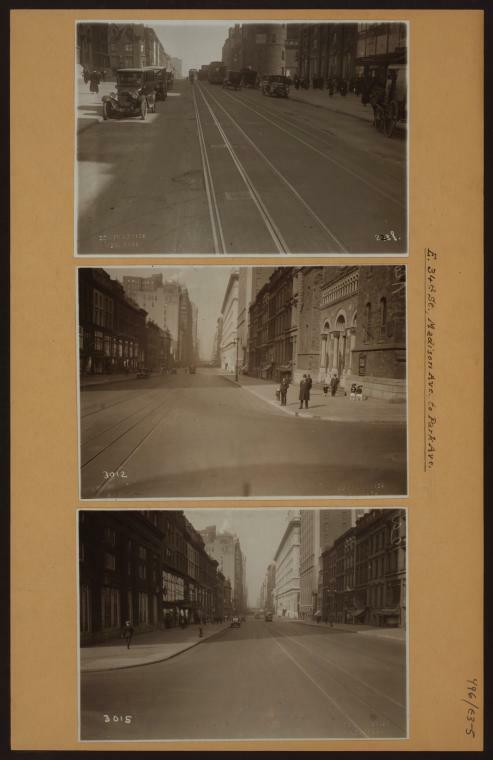 So we’re posting some photos of what 34th Street once looked like, not because we want to return to the good old days, but to show that there’s nothing sacred about the current design of the city’s streets. Looking back, it’s clear that at least until painted bus lanes were installed along 34th Street in 2008, the current configuration of the street gives more space to the automobile than any before it. 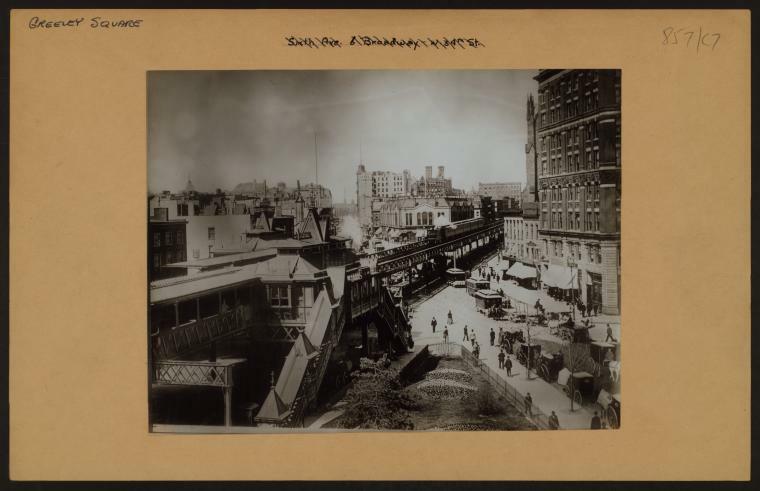 In 1911, for example, the city took seven and a half feet from each sidewalk on 34th Street in order to widen the street. 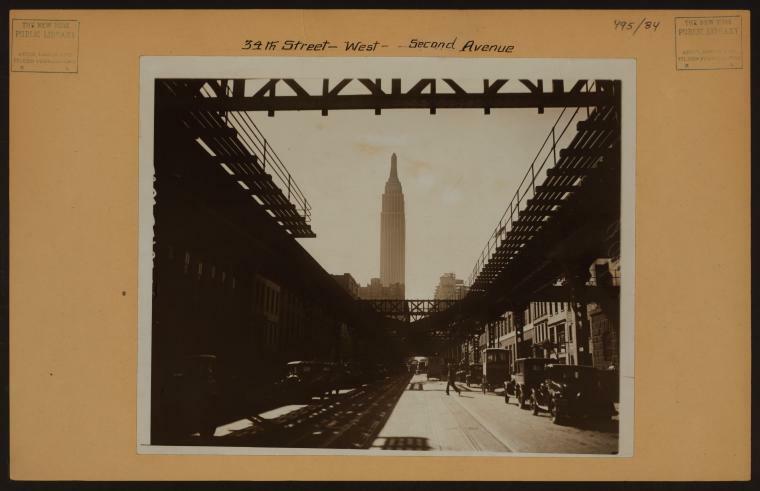 34th Street has changed a lot, and it will have to change again to work well for New York City in the 21st Century. It’s funny reading about the celebrations of motorbuses replacing streetcars. It’s like celebrating having your office moved another 20 minutes from home. I suppose those in the celebrations imagined what it said: replacing streetcars with buses. Instead the streetcars got replaced with cars and an occasional bus. Cars have been around for a hundred years. 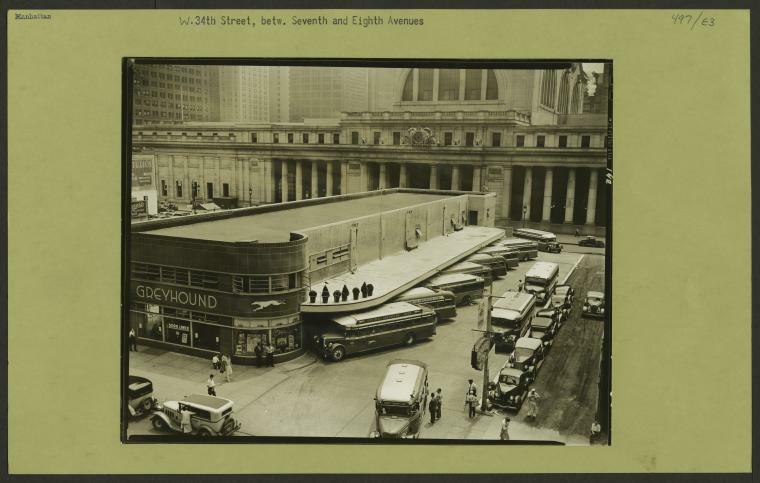 Automobile use usurped transit as the principal source of transportation as early as the 1920’s. Transit use peaked in the 40’s. At it’s inception cars we’re exclusive toys to the rich. No one complained when rich people we’re the only one to own car and have them on the streets. Now that everyone has cars, its a different story. I bet they don’t even spell hypocrite with an “H”. Passengers had good reason to celebrate replacing streetcars with buses at that historical moment. Those streetcars are not the modern operations we run today, and they suffered a lot of problems from running in mixed traffic that buses mitigate. Look at the pictures (or talk to people who have lived in Toronto, where they have only slowly been able to resolve some of these problems). You’ll start to understand some of the real concerns. First, look at where passengers boarded and alighted the vehicles: in the middle of the street, with no protection from vehicular traffic. Also, limited to fixed rails, they got stuck behind every left-turning vehicle waiting for a gap in traffic. Buses can change lanes and continue on the route with much less delay. Finally, consider that they were replacing older, noisy vehicles with spanking new, shiny, rubber-tire vehicles. The attractiveness should seem obvious. Can you make an argument that the change was short-sighted by focusing on the immediate operational issues, instead of the long-term operation of the overall street and broader transportation network? Sure, and it’s very easy for us in retrospect. But you can’t reasonably argue that they had no reason to view replacing streetcars with buses as an improvement at their point in time. LazyReader, not everyone owns a car, especially in NYC. Don’t be a “lazy thinker” as well. Cars are not going to be a viable form of transportation if energy prices keep rising as they are predicted to do. The free market will decide private motoring will go the way of the dodo. Jace, I’m pretty sure that LazyReader is Randal O’Toole. It would take a lot to convince him of anything, but it’s good to counter his propaganda. Thanks for fighting on. To effectively fight for better transit, having strong arguments that address all the concerns is really important. This post is interesting, but it seems to suggest the only issue is passenger transportation. I think a lot of the concerns that actually surfaced involved deliveries. If you can address those, you’ll have a better case. Reducing POV use improves the ability to receive deliveries, and I have yet to see any proposal that harms the ability of any building in midtown to receive deliveries. Even the pedestrian plaza only means they’ll require more footwork. I live on 34th. Neighbors opposed to the malling tend to be vocal and old. Others aren’t paying much attention. Deliveries: I would hate it if the city took away Fresh Direct access to Sanka and Depends. But in this regard, I have faith that FD would find me. Bad for Business: How many of you merchants on 34th have autos pull up by the curb and drop off customers or load up their trunks? Maybe think about taking advantage of increased foot traffic and bus access. Emergency (hospital) vehicles: This is an empirical question, but it sure seems like ambulances could share bus lanes, and the result would be a quicker trip. Property Value: For residents, 34th and environs offers no intrinsic attributes other than access to more desirable destinations. This is a substantial attraction. Faster and more pleasant access to increasingly attractive far-west midtown would be very nice.